Sphynx Cats, they are unique, exotic, rare and for many a bit weird. People are drawn to their strange appearance and nakedness and are often surprised by their soft feel and unique, sweet temperament. With a distinctive name they conjure up images of statues and paintings across desert sands in the funny snake hats. Along with mystique comes myths, and whereas the character can create a great story; the myths can be dangerous for both owner and pet. Why dangerous? To dispell one huge myth about purebreds, they end up in shelters just like any other cat and the reasons are the same; people not having an understanding of cat behavior, breed requirements or the commitment to work through problems to care properly for cats. Paying big bucks does not automatically make for a responsible owner, and before you buy or adopt ANY pet, you should have the facts to make an informed choice and not just an emotional one. Since this is a blog that features Sphynx Cats and because most of the information I give about my cats is to dispell a myth about them, let me give you my Top 5 Myths about Sphynx CatS and Hairless Breeds. Unlike lists that drawn you in by putting the most important fact at the very end, I work in reverse. Myth #1 – Sphynx Cats are Hypoallergenic. If you remember nothing else from this post, remember this; there is no such thing as a hypoallergenic cat. Repeat it to yourself if necessary. Let me start with a brief, simplified biology lesson. Everything that is organic; people, plants, animals, insects, fish as a component of what make them are proteins. That means everything you are; your hair, skin, fingernails, poop, saliva, tears, urine contains proteins. One particular protein in cats, Fel d 1 is mostly associated with allergic reactions in people. That means if you are allergic to cats you are allergic to the whole cat, not just the hair and saliva. Anecdotally it is reported that people with an allergy to cats tolerate breeds like Sphynx and other hairless breeds, Cornish Rex and Devon Rex better than most cats. It is my personal belief this is psychological rather than physiological since many people assume they are allergic to cats rather than go in for the full test. In fairness, people do have varying degrees of allergic reactions to cats so seemingly one can have a lesser response to a reduced exposure to the allergen. As an individual who is allergic to cats, please believe I am just as allergic to Moshe Moshi and Lexi Liu as I was to Tubbacat (my rescued DSH Tabby, RIP). I have a rigorous regimen of pet care, environmental controls and procedures that allow me to live with my two cats. Look for this regimen in a later post. Other than the designer cat scientist created that reduced the Fel d 1 protein in that cat (by the way you can own one for $7,000 USD), two breeds that contain lower levels of Fel d 1 protein; Siberians who are wonderfully hairy and Balinese, also with fur. When I adopted Moshe Moshi, he had terrible gas and diarrhea. His Vet treated his diarrhea with medication off and on, but he remained gassy. At first, I accepted this because everything I read on the net suggested this was just true of the breed. He was later diagnosed with food allergies and treated for IBS/IBD symptoms. A breed specific symptom never sat well with me, and I sought a different explanation to his gas issue which had to start in his gut. If you follow post on this blog for the last two years, you know I feed my cats a raw diet as paleo as I can get it. Your urine and feces smell can be an indication of a disease process in your body, but the aroma is telling of how well your body processes your food. Moshe Moshi has no symptoms of IBS/IBD since embracing raw feeding. Whether you chose to go our route or seek your Vet’s advice, just know gassy is not a normal condition for any cat or dog. UPDATE: By the way, if your cat has food allergy issues (mine do), then a good read about hypoallergenic food for pets can be found at the Pawsome Kitty blog site. I must admit; I have fun dressing my cats. This little piece of my personality surprised me. I’m a bit sensitive to issues of humiliation and to look at some of the costuming done to pets I can’t help but feel sad for some. However, if you do it right with the comfort of your cat foremost, both you and your cat can have a good time with it. I hear the argument that it is not safe for your cat because it’s not natural. My analogy for that is that you drive a car because it is convenient, necessary or it is fun, not because it is natural. Natural is the purpose of feet. My cats enjoy the attention, and the clothes, customized to their bodies. In truth, clothing is not necessary for their existence or care. The clothes are a solution to an environmental issue, namely temperature. Sphynx reacts to ambient temperature like people. If a Sphynx feels chilly, it will find a way to warm up, usually next to you. I like cool weather, so I have an abundance of fuzzy blankets all around the house. If not for the fact that my Sphynx goes out with me, there is no need for clothing. The absence of hair does not mean low maintenance; quite the opposite. Because of the lack of hair and eyelashes, Sphynx requires weekly if not daily maintenance. At the very least they need a bath anywhere from every four to 14 days depending on the condition of the skin. Ears and nail beds at the very least cleaned once a week. AT THE VERY LEAST! This breed has a history of HCM (Feline Hypertrophic Cardiomyopathy) which is a thickening of the heart muscle wall. The result is an enlarged heart. Think of it like Congested Heart Failure in people. Because of this, plan on heart scans fro life. My recommendation is every other year if the first scan shows no disease process and every six to 12 months if the first does show thickening. Unlike with your people, HCM is not a disease of age. It is an inherited disease that can appear at any age which is why it is important to scan regularly. I have to blame Proctor & Gamble for this one. In 1989, the Valdez oil spill was the worst environmental disaster ever to hit a US coastline. The impact on wildlife was devastating and long standing. The supplies the clean-up crews used had little effect removing the crude oil from the animals, and they were fast running out of what they had on hand. Then someone suggested Dawn dish soap as a temporary measure. It worked not only well, but also had few side effects. The rest is history, or rather a re-marketing. The product was never meant to be in repetitive use to bathe animals. For disclosure, I use to use this to clean my cats’ feet but later found better ways to get the gunk off their nail beds. Your cat is ingesting detergent every time it licks itself, and over time if not rinsed thoroughly could do severe damage to your cat. Because Sphynx cats are prone to a build-up of oils and grime, they require regular bathing. Dish soap is cheap. Don’t be cheap. Find a cat-friendly shampoo or ask your Vet for a product. For years I used Nature’s Miracle’s Danger Removing Shampoo. It worked great; that is until the company discontinued the product. I tried a couple marketed as Sphynx Shampoo, but there was nothing special about them, and they did a lousy job for the price. I asked a Vet Tech friend who owned Sphynx, and she recommends the product I currently use. I also use regular coconut oil from the grocery store for skin conditioner. More information about products in a future post on our Hairless Maintenance tab. There are more myths to address; no, they are not dry or scaly. No, they are not naked because I shaved them. No, they are actually not hairless, it's just very short, and some do grow substantial hair. No, not all are verbal. No, they are not evil like the ones on “My Cat from Hell.” No, I am not a witch, or am I? I love this breed apparently. Moshe Moshi and Lexi Liu are the joy of my life and despite what I have to go through to keep them; I wouldn’t change a minute of it. There are no judgments here about adopting versus buying. You should get the cat you can afford to maintain and are prepared to commit to for its entire life. However, if you are considering making one a part of your family, please consider first a rescue organization. Try Purebred Plus Cat Rescue, Purebred Cat Rescue (they are two different organizations), The Rexphiles and our #1 recommended group if you want a Sphynx, Sphynx Open Arms Rescue, but only after you do your research and know what you are in for with owning a Sphynx or any hairless breed. If you do decide to go the breeder route, please find one that is reputable. These are not cheap cats to buy or own so keep that in mind. I am available to answer any questions about the breed. All of these rescues, especially SOAR does great work, so donations to continue that work is appreciated. If you need to surrender a Sphynx, please contact Sphynx Open Arms Rescue before you place your Sphynx at the shelter. Excellent post. 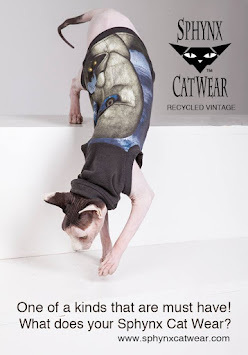 I love seeing Sphynx cats on here and some other blogs, but I had no idea how much work was involved. Thank you. I have been working very hard on improving not only my writing but also the quality of the information I am providing on the blog; reliable sourcing, editing programs, better-focused content. Your comment greatly appreciated.